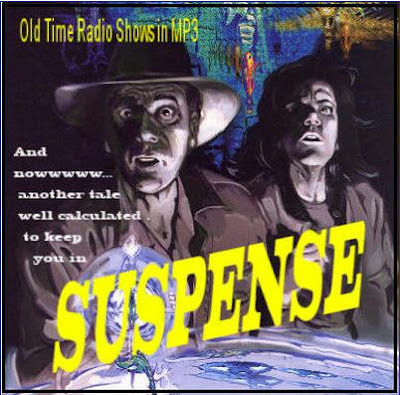 Suspense was a radio drama series broadcast on CBS from 1942 through 1962. One of the premier drama programs of the Golden Age of Radio, was subtitled "radio's outstanding theater of thrills," and focused on suspense thriller-type scripts, usually featuring leading Hollywood actors of the era. Approximately 945 episodes were broadcast during its long run, and more than 900 are extant. Suspense went through several major phases, characterized by different hosts, sponsors and director/producers. Formula plot devices were followed for all but a handful of episodes: the protagonist was usually a normal person suddenly dropped into a threatening or bizarre situation; solutions were "withheld until the last possible second"; and evildoers were punished in the end. The program made only occasional forays into science fiction and fantasy, including "The Man Who Tried to Save Lincoln" (a time travel fantasy), an adaptation of Curt Siodmak's Donovan's Brain and an adaptation of an H. P. Lovecraft short story, "The Dunwich Horror". Herbert Marshall portrayed the mysterious lodger, and co-starring with him were Edmund Gwenn and character actress Lurene Tuttle as the rooming-house keepers who start to suspect that their new boarder might be the notorious Jack-the-Ripper. [Gwenn was actually repeating the role taken in the 1926 film by his brother, Arthur Chesney. And Tuttle would work again with Hitchcock nearly 20 years later, playing Mrs. Al Chambers in Psycho.] Character actor Joseph Kearns also had a small part in the drama, and Wilbur Hatch, head musician for CBS Radio at the time, composed and conducted the music specially for the program. Adapting the script to radio was not a great technical challenge for Hitchcock, and he cleverly decided to hold back the ending of the story from the listening audience in order to keep them in suspense themselves. This way, if the audience's curiosity got the better of them, they would write in to the network to find out whether the mysterious lodger was in fact Jack the Ripper. For the next few weeks, hundreds of letters came in from faithful listeners asking how the story ended. Actually a few wrote threats claiming that it was "indecent" and "immoral" to present such a production without giving the solution. In the earliest years, the program was hosted by "The Man in Black" (played by Joseph Kearns or Ted Osborne) and many episodes written or adapted by the prominent mystery author John Dickson Carr. Escape was a similar anthology thriller and suspense program. The two series occasionally adapted the same stories, though Escape had lower budgets — and thus fewer name actors. The sponsor became Roma Wines and then Autolite Spark Plugs; eventually Harlow Wilcox (of Fibber McGee and Molly) became the pitchman. William Spier, William N. Robson and Anton M. Leader were among the producers and directors. 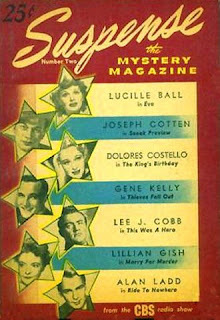 Second issue of the 1946 magazine tie-in. The program's heyday was in the early 1950s, when radio actor, producer and director Elliott Lewis took over (still during the Wilcox/Autolite run). Here the material reached new levels of sophistication. The writing was taut, and the casting, which had always been a str ong point of the series (featuring such film stars as Orson Welles, Joseph Cotten, Henry Fonda, Humphrey Bogart, Ronald Colman and Cary Grant), took an unexpected turn when Lewis expanded the repertory to include many of radio's famous drama and comedy stars — often playing against type — such as Jack Benny. Jim and Marian Jordan of Fibber McGee and Molly were heard in the episode, "Backseat Driver," which originally aired February 3, 1949. Another noteworthy episode was "The Hitch Hiker," in which a driver (Orson Welles) is stalked on a cross-country trip by a nondescript man who keeps appearing on the side of the road. This episode originally aired on September 2, 1942. 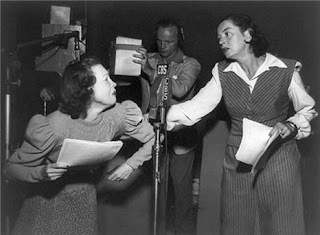 The single most popular episode of Suspense is Lucille Fletcher's "Sorry, Wrong Number," about a bedridden woman (Agnes Moorehead) who panics after overhearing a murder plot on a crossed telephone connection but is unable to persuade anyone to investigate. First broadcast on May 25, 1943, it was restaged seven times (last on February 14, 1960) — each time with Moorehead. The popularity of the episode led to a film adaptation, Sorry, Wrong Number (1948), starring Barbara Stanwyck. Nominated for an Academy Award for her performance, Stanwyck recreated the role on Lux Radio Theater. Loni Anderson had the lead in the TV movie Sorry, Wrong Number (1989).